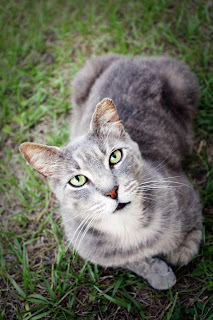 This is one of the neighborhood cats that hang around our yard, and yes, we feed them. We call him Buddy, he showed up a few years ago looking skinny. We felt bad, fed him and the rest is history. He can be found in our backyard along with the Cat posse. He has a girlfriend as well as other cat friends. They had drama a few months back when his girlfriend cheated on him with another cat, but I am happy to report that they are back together and the other guy has left town. (I'm pretty sure that he is the leader of the neighborhood cat mafia.) Aside from being mean to other cats, he is the sweetest most affectionate cat to people. I like this picture because it reminds me of a cat senior photo, and I really like the lighting. Check out my entry for the silly face contest, and check out all of the other pet photos by clicking on the link below.